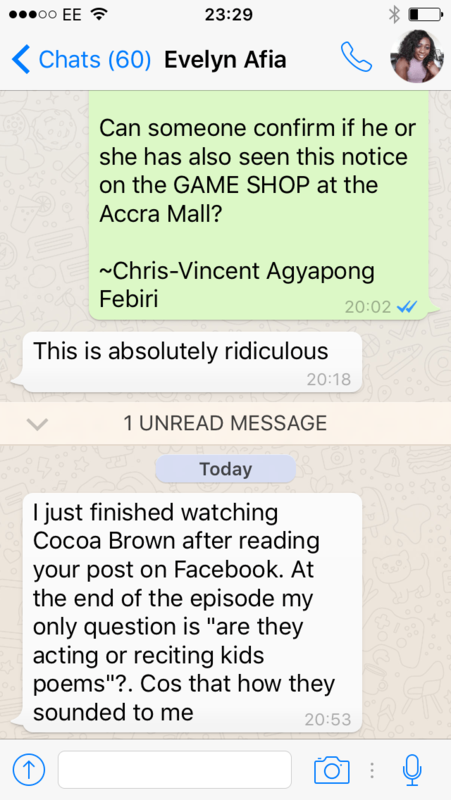 On the back of the initial success of her first TV series-Afia Schwarzenegger which somewhat lost its momentum and audience to the exit of its lead character, Deloris Frimpong-Manso recently aired her latest production, Cocoa Brown directed by Kofi Asamoah—-after months of social media promotion and a failed machiavellian attempt to generate media buzz with an in-house orchestrated controversy as to who actually owns the name-Cocoa Brown. The first episode of “Cocoa Brown” is currently on Youtube with comments disabled, perhaps, an attempt to prevent those who would watch it from discouraging others with their disparaging remarks about the overt execrable acting and unpardonable production flaws of the episode. When the first episode of a TV series, which ought to serve as the strongest bait is clouded in glaring production flaws agglutinated with egregious acting, you would find yourself summing up how disastrous and odious the rest of the journey would be. 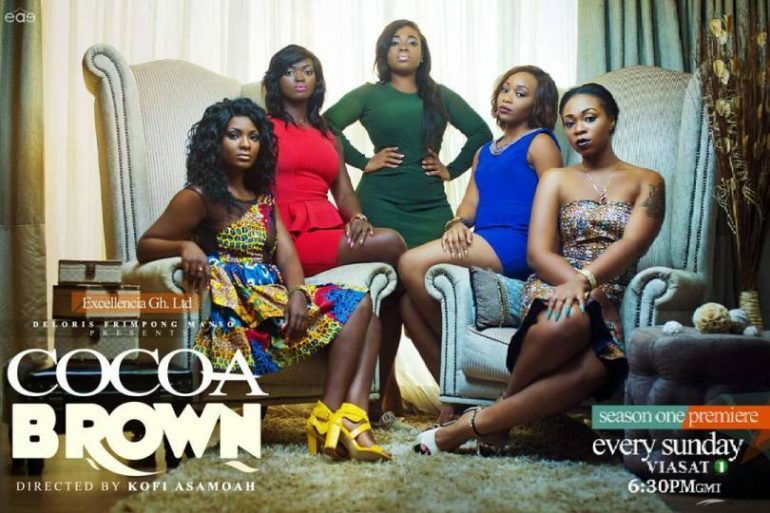 “Cocoa Brown” seems to have been elevated a little beyond the repugnant rhetoric of Afia Schwarzenegger, seemingly targeting an affluent audience that would find solace in a collection of “posh speaking” new and established actors—-except that, the lead-Ahoufe Patri fails once again to make a good case for her acting, inevitably casting a shadow on almost the entire cast. With the first episode cleverly and deliberately placed not to give off the plot, a convention in the intriguing world of TV series, the least the show-runners could do was to present a spellbinding introduction, capable of generating keen interest for the subsequent episodes. 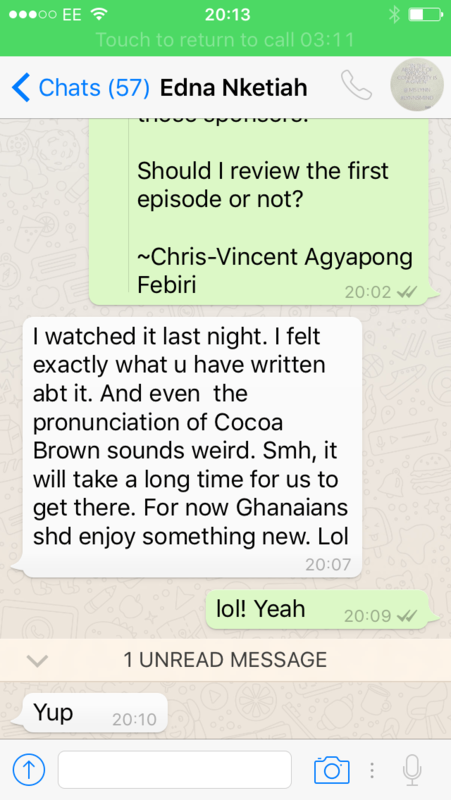 Cocoa Brown’s first episode fails to do this in so many ways—-notably, the lead actor-Ahoufe Patri’s terrible acting is strenuous to the extent that you wouldn’t want to bother with what’s next to come if you have several alternatives begging for your attention. And as a lead, she fails to coalesced the brilliance of those around her—-that’s if there’s any. Caroline Sampson and Godfrey “Black Boy” Laryea are equally terrible if not worse, with just a tiny dose of brilliance coming from Jasmine Baroundi, yet incapable of settling the hovering dust of torment her co-stars serve. The brutal truth is; Ahoufe Patricia cannot act. Beyond the individual excruciating acting, the production quality is perfectly synonymous to Kumawood—-for the twenty or so minutes, you are served with a teeter sound, lurching up and low. A case in reference can be vividly picked up at point 14:57 where the pitch of the dialogue instantly increases from a comfortable low to a level such that you would be compelled to lower the volume of your device to create your own sane balance. The lack of consistency or balance in the sound also serves as a bulwark to the salient role of the ambience sound, sometimes making it seem it has totally disappeared—-this could also be an issue with mixing. Whatever it is, it makes it difficult to enjoy the episode. Then there’s the indiscriminate aerial shots which patently have no bearings on the pre and post scenes anytime they are used, except to probably remind us that a drone was on set and it’s woefully being abused. This seems to be a problem with director-Kofi Asamoah’s expression of art, he continues to misemploy aerial shots, a repeat of what he did in Amakye and Dede. Aerial shots are beautifully but they must add value, even if subtle to what’s at stake or must compliment a scene. It’s gawky and not to be contemptuous, mainly fatuous to just throw them in there without any scene connections as if they have been removed from a different movie and poorly inserted. This is the hallmark of Kumawood, using beautiful unrelated shots as some sort of cinematic interlude in-between scenes. The production quality does not in anyway reflect the progressiveness of the contemporary TV series market and it surely fails to take into consideration the huge vault of master pieces like Game of Thrones, Breaking Bad, Marco Polo, Empire, Scandal, Shampaign, An African City and the host of others it is piteously set to compete. At this stage, the storyline is faintly being developed and it would be unfair to attempt to access its strength or weakness—-though I would say, employing flash backs in a twenty minutes premiere episode meant to set the foundation of a long journey is not the best practice. And there was absolute no suspense or a striking moment: the story flows from Ahoufe Patri’s work place, aided by a pre-start narrative and soon, we are thrown into a black hole of flashback—-a journey to understanding where she finds herself today. Even though those involved in “Cocoa Brown” hyped the TV series before its first showing, as GOT and the many other excellent TV series have shown, the strength of a series lies in the post showing conversation—that is what pulls in people to watch or follow it. And ‘Cocoa Brown’ was literally and metaphorically dead on social media post showing, an indication that it couldn’t catch the needed fire. For some of those who have watched it so far, the apparent inconsistency in the pronunciation of the lead’s name-Cocoa Brown is what sets forth the watching anguish for them. The acting de3, so true Patri can’t act & I side with the comment saying she’s over-hyped; however I think she’s putting that “hypement” to a good use paaa”. lol, still love her though & personally, I’m watching so I would know the gist/ controversies, etc surrounding Delay’s life. lol. I.K it might be scripted but that’s the entertaining part for me plus the whole hype/ social media controversy prior to the premiere I believe really worked but now it’s up to them to prove to us if it’s worth watching….which I doubt judging from the first episode. Ohh Darling Delay. I love u but I couldn’t watch pass 10mins. I really tried Love but it wasn’t going as expected. I could have been hopeful for a better episode but I think it’s just the cast. Your Patri girl isn’t that good and so I don’t think I will ever be able to watch. She really bored me??? So I am not the only one who felt like what am I wasting my time watching. They made so much noise about this on instagram only to give us this half baked thing. The acting is poor and it is as if they used a mobile phone to shoot it like done in Kumawood. If they did it in twi, it would be so Kumawood. Doesn’t make sense to air this for a production that has been so hyped. I am disappointed Caroline is part of this. she needs to pull out of this ghetto display. she and those other girls are on different levels please. and ahuofe patri is not an actress, she is just a lady who got lucky in local comedy playing the hood fine girl. which is fine but she has been oversold and now she is struggling to justify herself. get some acting classes patri and come back strong with this or something else. people will not keep watching you just because they love you and kalybos. the producers must also stop being so local and too known and get help or assistance from other people who know their business. afterall if the show succeeds, it is for your pocket. this has been overhyped and under delivered. clean out that cast and finish the show properly. This is the most useless way I have wasted my morning. Out of curosity I decided to watch it and that black boy is like reciting a poem. WTF is wrong with Ghanaian film makers. Is this what they expect people to waste their time watching? Watching this is very painful I must say. The narration at the beginning is so unnecessary. There was nothing to this than just a plain screen movements.. Some of the shots didn’t complement the scenes. I was just disappointed at the level this is. At one point I actually taught my phone is not working due to bad sound. Using musicians didn’t add anything to it because it doesn’t make any sense.. Trying on foreign ascents is a low blow. Very bad production. Kumawood movie even has some sort standard. 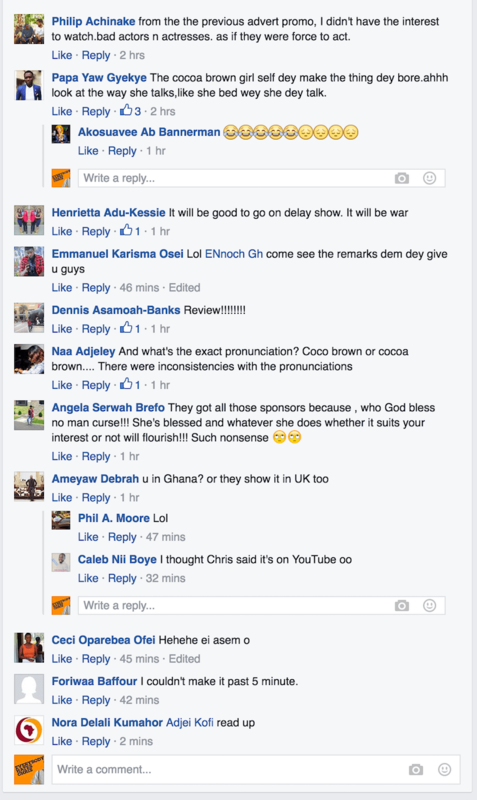 Eiiiii Ghanaians aaabbbaa! what is wroung with this production. i just watched it here and found nothing wrong with it. very educative i must say. what i learnt in short is to follow your passion and not follow youthful pleasures. The picture quality is excellent, good shots of Accra city and great camera angles. Black Boy Caroline Jasmine and Ahuofe Patri were great. she was in character through out because this was a 17 year old girl who was in love. stop the pull him down syndrome and support them. aaadeennn…..
i agree with u on this my dear..Ghanaians are too quick to judge and always fail to really analyze and appreciate or interpret what the facts are. A 17 yr old will act and behave exactly same when in love. and that’s what ahuofe did so well. Lol no we are not quick to judge. First impression they say it counts. 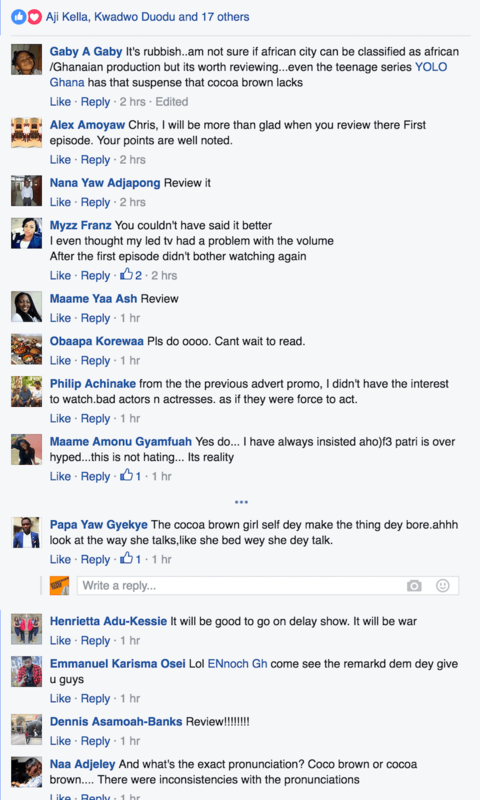 If one episode is this bad, how can the rest be good for we viewers? You are rather encouraging bad work for delay with this supporting comment. I love to call a spade a spade and to be honest with you, majority of the entire Ghana feels is bad. Am sure you are anxiously waiting on the next one with fingers cross. Well good luck lol. I’ve watched the series…it wasn’t so bad…just thinking they could have done more research on some things to match it up…technical part to me was a bit bad but I liked the series…ahuofe Patri is meant to be a naiv young girl with dreams…with time I’m sure the show will be more fun as other characters are being introduced….Caroline made me laugh….the only one professional paaa so far is jasmine Barou something….I’ve never had her name right…but all the same it’s not that bad pls if you can’t at least give some little credit paa di3 don’t pull them down…I thought it was alright but yes they can’t pass YOLO but then again this is just their first season and episode…. Lol seriously what were you people expecting? Some classy series like African city or what? There’s a saying in our local dialect “kwatroka se obema wu Ntoma ay3 ti3 n3 din”. You people lol already know how trashy and unethical our successful delay sound whenever she’s doing her interviews. I mean don’t get me wrong I respect and admire her success but she’s unprofessional for the big screen. The series is 100% kumawood with no better story line.. Ahoufe patri is another boring actress who needs to grab a seat, I agree with those saying she’s over hyped. Oh well one episode has failed so no need to waste time on the upcoming ones. Yolo nailed it and thanks to our old time legend Ivan kwasigah and his crew. Shirley please bring us a better series this summer before our screen collapse… Chris lol thank you for always saying the truth. Lol take it easyoooo even the owner is not here to create any fight. Why do I feel you are delay herself with this lol sad comment. If you watch the series over and over you will understand where the writer is coming from. I don’t think is worse but certainly not a good series for viewers. Delay brags a lot so everyone was dying to expect a great series than this failed one. Some of us are a bit disappointed after the continuation of things we do for love (yolo) entertained us. You wouldn’t be here if you know whats up ?? Well delay is a typical village girl who’s doing good for herself. She just talk a lot which made everyone disappointed after episode 1. Thanks I wasn’t expecting anything good from such a villager and she won the label as kumawood. There’s nothing wow about this coco brown show. Lmao truth!!! Is a total disappointment and she’s too krasinii for that matter too. I don’t think it will get any better in the upcoming ones. Delay should get a good editor and a narrator next time ?? From an American perspective, I found the acting to be a lot better than some of the Ghanaian, Nigerian and Kenyan TV shows and films I’ve watched online. The sound was off in some places and out of sync in others. Beyond that, I appreciated the aerial views and had no serious complaints about the production value. I only wish that more than one episode were available on YouTube. Where can I watch the rest of the season?